The state government kicked my family out of our house. We drifted like nomads, homeless. No, we didn’t fail to pay our taxes or mortgage. They kicked us out of our home because they wanted to help us. Really. We’ve tried a lot of alternative therapies while treating our son’s autism. For a while we were doing chelation therapy, which is supposed to remove heavy metals from my son’s system. To ensure Rocco’s liver and kidneys could handle the treatment, we had his blood tested every six months. One of those tests revealed elevated levels of lead in Rocco’s blood. The levels were so high, the state health department was notified. The local health officer came out, and took dust samples from around our house. Yes, there was old lead paint around our windows and in our front porch. We would need “lead remediation” in several areas of the house. We tested Roc’s blood dozens of times, both before and after the state got involved. The elevated lead levels were never repeated. One of Rocco’s doctors suggested the chelation therapy was working, and he was experiencing a massive lead dump. So began one of the most harrowing and intrusive ordeals my family has ever endured (and, as parents of an autistic child, we’re not unfamiliar with hardship and heartache.) Our case was handed over to a lead abatement specialist at Lew Corp. (a contractor that watches other contractors remove lead, and reports back to the state). 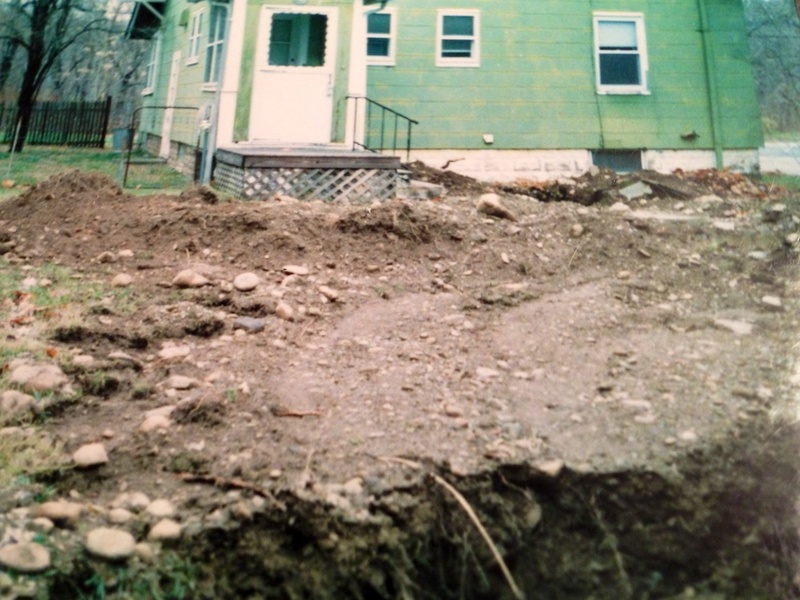 Lew Corp. did its own lead assessment of our home, and outlined a detailed remediation plan. They gave us a list of state-approved lead remediation contractors. We had to get three bids and pick one. New siding, new windows, a new front porch … autism is like a box of chocolates. You never know what you’re gonna get! Ah, The Sweet Scent of Asbestos! Every contractor who bid on the job informed us we had asbestos shingles on our house. If the shingles cracked and crumbled, they could be just as toxic as lead. The state didn’t see it that way. 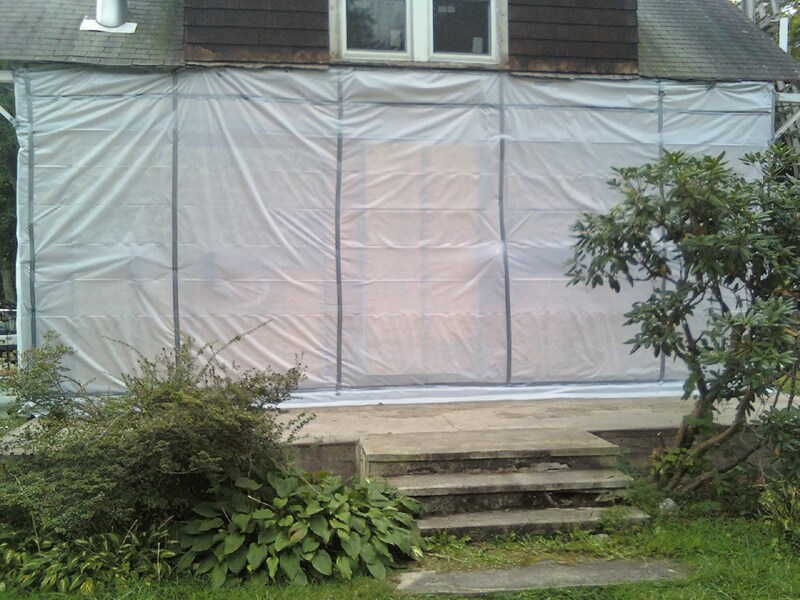 They’d only give us a loan for the lead work; we’d have to pay for asbestos removal and new siding ourselves. We borrowed even more money from family members. The terms of the DCA loan were pretty good. It was a forgivable loan payable over 20 years. If we lived in the house the next two decades, the loan was considered paid in full. If we sold after ten years, we’d have to pay back half, if we sold after five years, we’d owe three-quarters of the loan, etc. The money in the state’s lead abatement fund came from taxes added to every can of paint. The loan seemed like a pretty good deal. Our front porch was in dire need of repair, and I couldn’t afford to fix it any other way. Besides, I wasn’t given much choice. “What happens if I refuse to have this work done?” I asked. Fine. We signed the DCA’s 20-year loan, and picked a contractor over the summer. Work was scheduled to begin in late August. We had to relocate during the construction, and put all of our stuff in a storage unit. Fortunately, we were able to move into my in-laws’ house. They were snowbirds, and wouldn’t be back from Florida until the holidays. That gave us plenty of time. The job was only supposed to take four weeks. The beginning was the worst. I wasn’t there the morning the workmen arrived. But I got a call from a friend around mid-day. I drove by that night. The workmen were gone, but the place looked like the scene at the end of E.T. : The Extra-Terrestrial when scientists descend upon the suburban home, and turn it into a sterilized military zone. The entire house was wrapped in plastic. There were “Danger: Lead Contamination” signs on our front yard. A portable decontamination shower was set up in the backyard. I went inside. Thick plastic sheeting covered all the walls and floors. 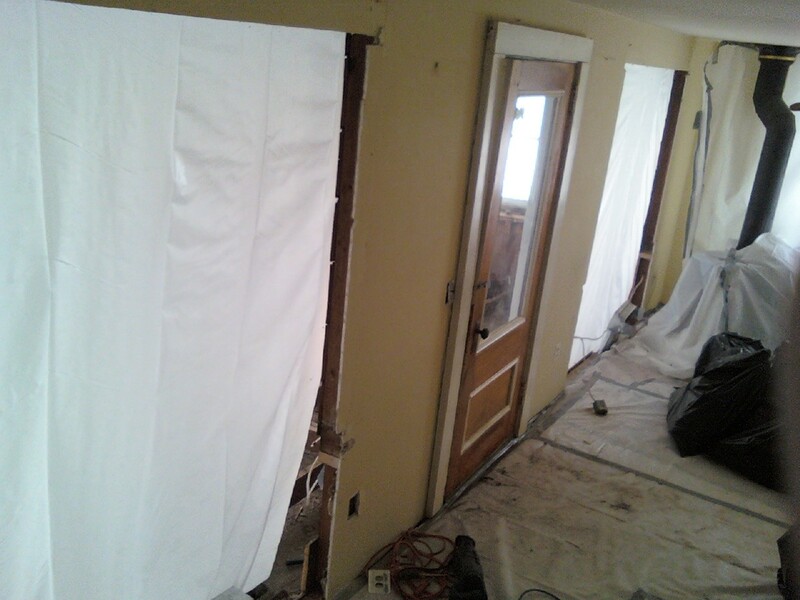 Doorways were sealed with plastic and tape. It didn’t even look like our house. It looked like a place where something terrible and poisonous had happened, a crime scene. I felt like crying. We live on a main road, so by the next day the entire town had seen the haz-mat crew crawling all over our house. My wife and I were mortified. What would our neighbors think? What would this do to local property values? We’d have to live in the house for the next twenty years to live down this level of public shame. None of this was mentioned in the terms of the DCA’s loan. 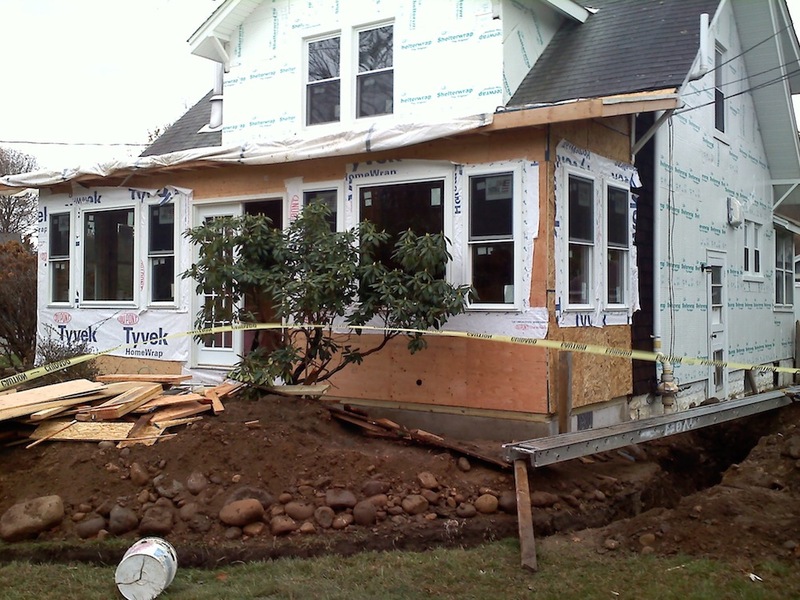 Before we got a new front porch, there were a few weeks when we had no front porch! Moving to the in-laws’ house wasn’t smooth sailing either. One morning Roc woke early, unlocked the front door, and took a stroll around the new neighborhood. Since we were new, nobody knew whom he belonged to, or where he lived. Rocco stuck to the sidewalk, but he crossed a busy side street several times, according to the nice neighbor lady who followed him around for half an hour. He wouldn’t tell her his name, or where he lived, but she stayed with him anyway. Eventually, Rocco walked back home. I found him and the neighbor lady sitting in our kitchen when I woke up. “Is he yours?” she asked. “Uh…yeah,” I said. My eyes were still filled with sleep, my arms full of our obese dog. I carried her downstairs each morning because she was too big to make it on her own. I was babbling. The woman smiled. “I figured as much. I live next door,” she said. She introduced herself. “Your son’s very cute,” she said before she left. He’s adorable, I thought, but he’s killing me. Thank you again, lady. This was every parent’s worst nightmare. You brought it to a safe end. Our house was still all torn up in early December 2010. The men in spacesuits were gone a few weeks later. Now our home looked like any other house under renovation. But the project hit snags, delays with plans and permits. The gas company had to re-route a line. Fall was turning to winter and the work still wasn’t done. My in-laws would be home for Christmas in a few weeks, and we needed to get out of their house and back to ours. The project wrapped up right after Thanksgiving, but before we moved back, we wanted to repaint the interior walls and refinish the floors. The outside of the house looked good — new siding and windows — and we wanted the inside to match. But since we were broke, we did the work ourselves. That took another three weeks, working like dogs every night and weekend. We moved back home the day before my in-laws arrived, one week before Christmas. It was a crazy holiday, moving boxes and Christmas presents battling for space in our living room. I try to see the whole ordeal (and it was an ordeal) as an unexpected bonus along my son’s autism journey — because he (allegedly) ate a paint chip, we got to remodel part of our home, making the place safer and more comfortable for the whole family. 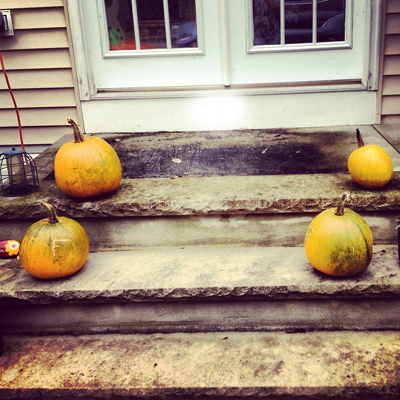 Homegrown pumpkins adorn our new front steps in October 2012. I learned some valuable lessons from the Lead House Saga. Read about them here.